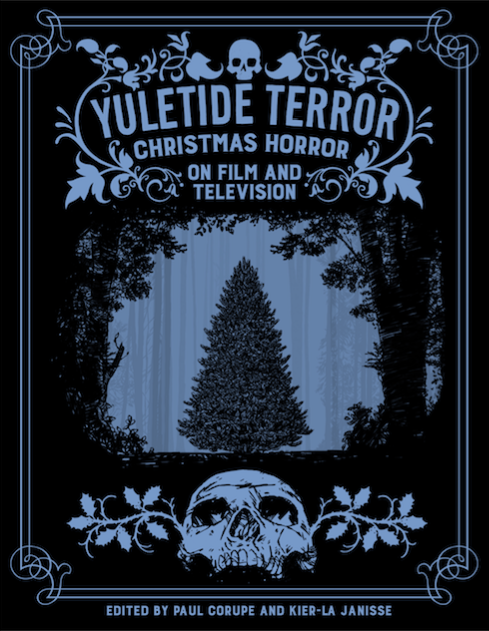 Yuletide Terror features new writing by both emerging and acclaimed authors including Stephen Thrower (Nightmare USA), Kim Newman (Nightmare Movies), Caelum Vatnsdal (They Came From Within: A History Of Canadian Horror Cinema), Michael Gingold (Fangoria), Shelagh Rowan-Legg (The Spanish Fantastic), Alexandra West (Films Of The New French Extremity), Michael Helms (Fatal Visions), Andrea Subissati (Rue Morgue), Zack Carlson (Destroy All Movies!!! ), Joanna Wilson (The Christmas TV Companion), Diane A. Rodgers (Cinema Retro), Andrew Nette (Pulp Curry), Amanda Reyes (Made For TV Mayhem), David Bertrand (Satanic Panic), Eric Zaldivar (Co-Writer, Django Lives! ), Leslie Hatton (Popshifter), Owen Williams (Empire), Ralph Elawani (Bleu Nuit: Histoire D’un Cinéphilie Nocturne), Derek Johnston (Haunted Seasons: Television Ghost Stories For Christmas And Horror For Halloween), Neil Mitchell (Devil’s Advocates: Carrie), Chris Hallock (Diabolique), Ariel Fisher (Rue Morgue), Lee Gambin (Nope, Nothing Wrong Here: The Making Of Cujo), Zach Clark (Writer/Director, White Reindeer) alongside co-editors Kier-La Janisse (House of Psychotic Women) and Paul Corupe (Canuxploitation).